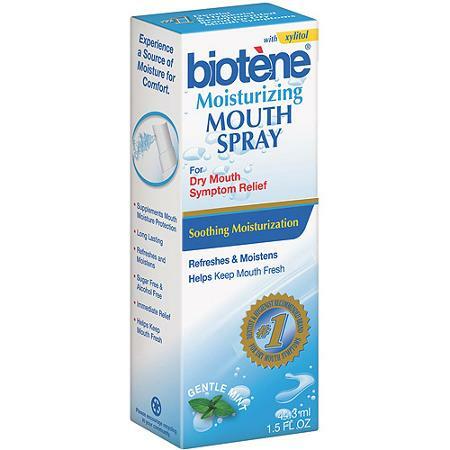 Biotene Moisturizing Mouth Spray keeps your mouth fresh and healthy. This Biotene Mouth Spray contains beneficial enzymes found naturally in the mouth. This Biotene Spray maintains the health of your mouth while providing relief for the symptoms of dry mouth. Naturally sweetened with xylitol, this Biotene Moisturizing Spray is a pleasant-tasting oral product that is sugar and alcohol free. This Biotene Mouth Spray supplements the natural protection your mouth provides. Designed to keep your mouth fresh for hours, this Biotene Spray is an instant treatment for the symptoms of stress or other similar conditions that can leave your mouth dry.